Veteran video game publisher Iceberg Interactive announced today that the all new gruesome zombie-filled DLC Gas Guzzlers Extreme: Full Metal Zombie is coming to Steam Monday, February 16. 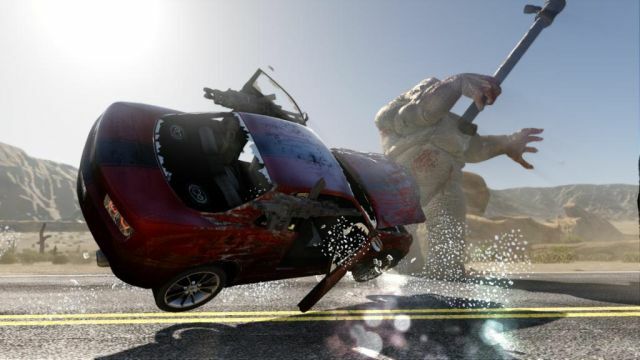 Gas Guzzlers Extreme: Full Metal Zombie is the second DLC for Gas Guzzlers Extreme, with its first DLC Full Metal Frenzy already released in May 2014. Full Metal Zombie is jam-packed with an enhanced brand of zombie-crushing gameplay that stars a two-story high zombie monster boss, enormous, feral zombie animals bent on ramming your car, and hordes of flesh-hungry zombies determined to gnaw your vehicle to bits. The impressive level of new content is so big it’s almost an entirely new game. Gas Guzzlers Extreme: Full Metal Zombie takes place in a Zombie apocalypse that’s taken over the hi-octane Gas Guzzlers Extreme universe. Armed to the teeth with high-powered weaponry, dangerous vehicles, and insane power-ups that litter each arena, players are more than capable of obliterating the hordes of the undead – but only if they’re smart. Full Metal Zombie plays like an entirely new game, introducing tons of new ragdoll physics, a wild array of zombie AI (slow, fast, human, animal, monsters, etc. ), blood, and body parts flying around. And a new military skin. Bust those Z’s like GI Joe! Master X Master unleashes their third new character upon the battlefield, and it's the Support Master, Titus!